Usagi first appears as a schoolgirl living in 20th-century Tokyo, a well-meaning but underachieving and accident-prone crybaby living the life of a normal teenage Earth girl. One day, Usagi encounters a mysterious cat, who later reveals herself as Luna, the mentor archetype who introduces Usagi to her new heroic role. Luna gives Usagi a magical brooch and explains how to use it to transform into Sailor Moon (the "Soldier of Love and Justice"); she tells Usagi that she is a Sailor Soldier who must fight for peace and find the rest of the Sailor Soldiers, as well as their princess. Though at first Usagi appears as a "reluctant heroine" (in the anime she often is rescued by Tuxedo Mask), as time goes on her character grows more confident and mature. She sets out to fight the evils of her past life and protects the Earth with the Silver Crystal, as Sailor Moon, providing most of the conflict within both the manga and the anime. 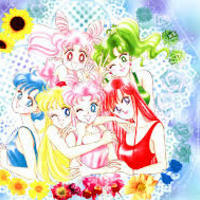 I'm Usagi Tsukino, fourteen years old! A talking Cat named Luna found me and transformed me Into the pretty guardian In a Sailor suit! Sailor Moon! Ahhhhh!!!!! I'm gonna be LAAATTTTEEEEEE!!!! Ami's most emphasized character trait is that she is extremely intelligent—in the anime and manga she is rumored by other characters to have an IQ of three hundred, while in the stage musicals this is stated as a fact. She is adept at English in both the musicals and the anime, and in the live action it was clearly, although briefly, demonstrated by the actress portraying her (actress Chisaki Hama was speaking to an English speaking character as her character was visiting the United States as a medical intern). Her peers view her with a mixture of awe and distaste, misinterpreting her inherent shyness as snobbery, and so she tends to have a difficult time making new friends. 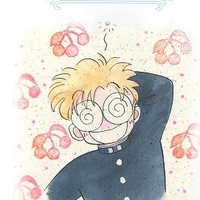 Ami is depicted as kind, sweet, gentle, and loyal, as well as slightly insecure. She also dislikes the fights of Sailor Moon and Sailor Mars. Anne Allison describes her as "a smart girl who needs to relax", calling her "conscientious" and "studious", "everything Usagi is not". Early on in the story, she relies heavily on the approval of her mother, teachers, and friends, but as the series progresses she becomes stronger and more confident in herself. She is generally the most sensible of the main characters, and is often the only one embarrassed when the group has a dull-witted moment. As the story begins, she attends Azabu Jūban Junior High along with Usagi Tsukino and, later, Makoto Kino. Rei first appears as a miko at the Hikawa Shrine, and is shown to have an affinity with two crows who live there. It is revealed in the manga that as a child, the crows "told" her that their names are Phobos and Deimos (the same as Mars' two moons). In the manga, she is portrayed as imperial, ancient, conservative, old-fashioned, traditional, serious, disciplined, and practical, having contempt for men and disliking modern romantic relationships. (Gasp) Could It be... A spirit...? Makoto's strong, independent personality is hinted at in her most striking physical feature—her unusual height (5'6" or 1.68 meters). She is stated at her first appearance in the series to be very tall, and considerable notice is taken in the original Japanese versions, although this trait is downplayed in English translations (as her relative height is not all that uncommon in most Europeans). She is physically very strong, and in fact was rumoured to have been kicked out of her previous school for fighting. She is introduced to the series after transferring to Azabu Jūban Junior High, where Usagi Tsukino and Ami Mizuno are students, and where she stands out all the more because her school uniform is different from everyone else's; unable to find anything in her size, her school's administration tells her to wear her old one. It has a long skirt, which when coupled with her curly hair, was a common visual cue for a tough or delinquent girl at the time the series was created. However, unlike these delinquent girls, her wavy hair is natural. Despite her tough appearance, she is very gentle. She always wears pink rose earrings and a green hair tie that decorates her ponytail. You should be more careful next time. 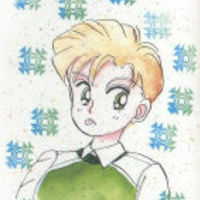 Minako is first introduced in the Codename: Sailor V manga, of which she is the lead character. She is awakened as a Soldier by the white cat Artemis when she is thirteen years old and instructed that she has a duty to become the beautiful warrior, Sailor V. Artemis explains that Venus and Earth are "twin planets" of about the same size and weight, that Venus is her "mother star," and that she must protect Earth from its enemies. He shows her Magellan Castle orbiting around Venus and says that it is hers, although the existence of these castles is not revealed to the other Soldier characters until late in the Sailor Moon series. She first dons her red hair bow during the first chapter of the story, on the recommendation of a handsome villain character that she defeats, and is almost never seen without it again. 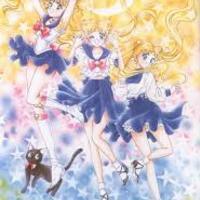 Luna is Usagi's black guardian cat, as well as her and the other Sailor Senshi's adviser. She lives with Usagi and she is shown growing close to Artemis, another feline guardian who belongs to Minako Aino/Sailor Venus. 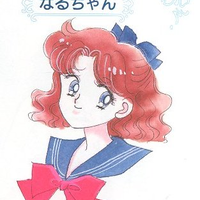 This is the original depiction of the character created by Naoko Takeuchi. (Meow) Usagi Tsukino, I am Luna and I am here to change you Into a Guardian of Justice... Sailor Moon! Usagi... Please, you have to study! You NEED an education! Artemis is the guardian and adviser to Sailor Venus. He is slightly forgetful and lazy, but when Minako turns to him for advice or his charge finds herself in trouble, he pulls himself together and becomes more of an actual father figure. He constantly picks on Minako but oftentimes is seen comforting her or going out of his way to try and make her dreams come true. Right, Sailor Venus. But... Are you sure? Usagi you stupid baby! I'm going to win that contest with my eyes closed! Mamoru Chiba first appears as a high-school student studying at Moto-Azabu High School. Before the beginning of the series, his parents are killed in a car crash on his sixth birthday, which revealed the memories of his previous life as Prince Endymion. Living alone, Mamoru befriends school student Usagi Tsukino. In the beginning of the series, dreams of Princess Serenity haunt Mamoru. Unaware of his dual-identity as Tuxedo Mask, he suffers painful visions whenever Usagi becomes endangered, and he transforms unknowingly into Tuxedo Mask. 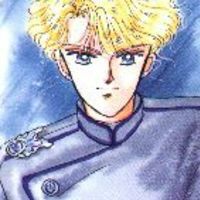 As Mamoru, he tries to piece together his strange dreams, and as Tuxedo Mask, he tries to remember his past and identity, while searching for Princess Serenity. He seeks the Legendary Silver Crystal in the belief that this will fully restore his previous memories. In the anime adaptation, he seeks it because Princess Serenity tells him to in a dream. Of all the characters, Mamoru gets brainwashed and captured the most throughout the series. Hey Bun-head! You need to study harder! (hands over test. Usagi: None of your busniss! :Sticks out tounge:) Whatever, Bun-head. Usagi! Time to get up! Fine! You can come In...! Stupid Usagi! Locked out of the house again! This Character Is Jadiete as a Monster! I'm not your Mother... You're Mother is dying of starvation In the basement! I know! But Sailor V stopped the robbers! You don't know who she Is?! Being Usagi's BFF! This is Naru! She's a very sweet and kind hearted character! Good luck! Have you lost your mind Usagi! That's the stupidest thing you could do In school!